It's that time of year again. Body clipping time. The recent Article on Eventing Nation, 'Misadventures in Body Clipping' made me think maybe I should share some of our hard learned tricks! I have a love hate relationship with body clipping. Watching the hair fall off in waves is strangely satisfying, and I love seeing a smooth well clipped horse that was only hours before a woolly mammoth. That said, clipping is also A LOT OF WORK. And getting short, prickly horse hair everywhere is no fun. Sarah Sage hard at work clipping Warren. 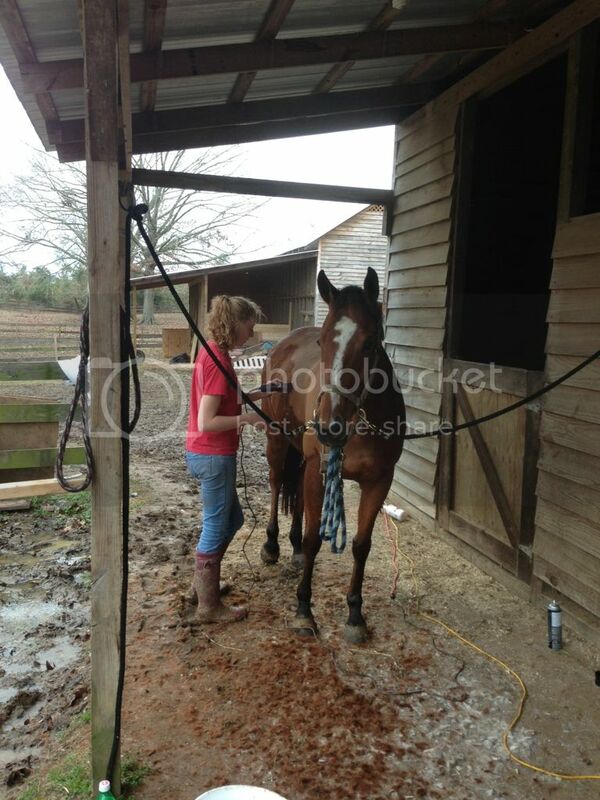 Give your horse a thorough bath. I'm talking about bubbles and elbow grease. Dirt and dandruff dull the blades and clog up the clippers. The hair will come off faster and you will ultimately use fewer blades if you have a clean horse. Make sure you horse is dry before starting to clip. Wet hair also dulls blades and clogs things up. Spray your horse with Show Sheen before you clip it. This is not something I ever suggest doing normally. Ever. Show Sheen and saddle is a bad call, nut in this case it makes the blades cut more easily. Have blade wash, oil, Kool-Lube, and a brush on hand to clean and oil the blades. You have to keep everything lubricated and clean to make it go faster. Take long slow sweeping strokes against the hair. I find I have more control over the blades if I make slower hand movements for my first pass over a hairy area. You get smoother lines. You can always come back with shorter strokes to clean up areas. Use big clipper with wide blades for body and smaller clippers with narrower, more maneuverable blades for detail areas like legs and face. Our big clippers gave out this year halfway through the second horse so we were stuck using some little ones until we could get a new pair. A nice big pair of clippers make a difference. To clip transition from neck to mane, hold main down with one arm so that the mane lies down flat and the hair you are trying to clip sticks up; clip perpendicular to the neck. This was you can make a nice clean line between the mane hair and the neck hair. If you're careful and the horse doesn't move suddenly, you get a nice smooth line without nicking the mane. Have someone pull the front leg forward to clip armpit area. This helps you to all the hard to reach/wrinkly places. In areas that are wrinkled or loose (like throat latch area, armpits, etc), pinch the skin so that it is taught. This makes it easier to get a smooth finish and also prevents skin getting pinched in the blades. Lift legs as if you were picking a foot to clip hair over tendons; this makes the tendons loose and it is simple to run blades along the lower leg and get everything in one pass. Horses also seem to like it better. Faces are hard. The first couple years I clipped, I tried to clip the entire face, but now I only do face up to the cheek bones. This is easier to do and ends up looking tidier since you don't have to negotiate eyes and all the crevices of the face. Never wear fleece. It is a hair magnet and will never come out. If you're worried about hair in your mouth and nose, you should also wear a dust mask. Make sure you're safe. Horses are unpredictable when there are cord and electricity involved it's good to be extra careful.